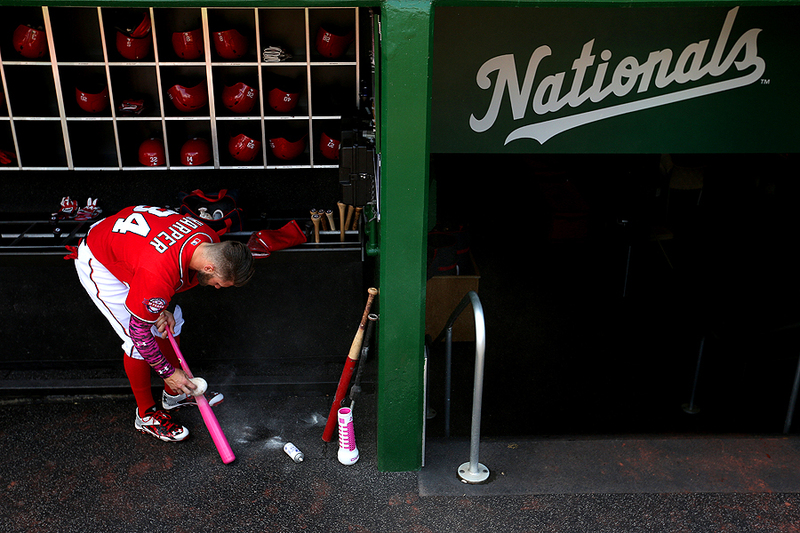 "Bryce Harper #34 of the Washington Nationals powders his bat before playing against the Atlanta Braves at Nationals Park on May 10, 2015 in Washington, DC. " Walk-off home runs are great and jubilation following is even better - but neither would be possible without proper preparation. Bryce Harper of the Washington Nationals has been on a hot streak - belting home run after home run last week before being named the National League Player of the Week. Following a three home run game, I found myself documenting a pair of games after the milestone performance - and it was challenging not to focus on the superstar. He ended up blasting a walk-off home run the day before this image and again had an all around standout day on Mother's Day. While the rectangles of all these hits, catches and celebrations with teammates spoke volumes - it was images like this of quiet moments preparing in solitude that spoke louder. One must prepare every day for success and Harper is no different than the rest of us.